Written by a Combat Pilot—Multi-Award-Winning Apocalyptic Thriller The Sector 64 books, Ambush and Retribution, have over 200 5-Star reviews on Amazon with more than 20,000 downloads! Find out why! What would you risk to save the world? Sandra just discovered she's pregnant. Then aliens invaded. Thrown to ground in the first attack, this fighter pilot might be the world's only hope. If you like action-packed, page-turning military thrillers, then you'll love the electrifying action in Dean M. Cole's apocalyptic audiobooks. Grab the Box Set Today and Save! Book One: Ambush Independence Day meets The X-Files when Air Force fighter pilots Jake Giard and Sandra Fitzpatrick join a decades-old global conspiracy to integrate humanity into a galactic government. But when a galactic civil war spills onto our shores, plunging the planet into an otherworldly post-apocalyptic hell, can Jake and Sandy save humanity from extinction? Book Two: Retribution Air Force Fighter Pilots Jake Giard and Sandra Fitzpatrick saved the world … twice! But That Was Yesterday. Following the apocalyptic events of Ambush, Jake must board and somehow control the advanced alien fleet of huge ships before they start falling into the Atlantic. Yesterday, Captain Sandra Fitzpatrick learned she's pregnant. Then she helped save the world. Now, she must keep her condition a secret (even from Jake, the father to be). The remnants of humanity need Sandy and her cobbled together band of warriors to somehow master the alien technology. If Jake and Sandy prevail, and if Earth's ravaged militaries can unite, can they adapt now outdated tactics to the limitless battlefield of space? And when dark galactic forces once again amass in our skies, can humanity make a stand? Grab your copy and start listening today. KirkusReviews.com: "Cole tackles the first-contact scenario with bombastic flair. His vibrant prose delivers the high-resolution imagery of a Hollywood blockbuster. A technologically riveting dream for sci-fi action fans." AudiobookReviewer.com: "SECTOR 64 was a highly imaginative action-packed apocalyptic assault on your mind." 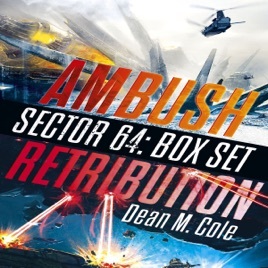 Audiobook-Heaven.com: "Cole has a good thing going ... His descriptions of aerial battle and his knowledge of the aircraft themselves fascinated me ... Sector 64 is a great read."